“If we now have to start apologizing for showing a friendly face in response to emergency situations, then that’s not my country.” With these words, German Chancellor Angela Merkel defended her decision to open Germany’s borders to tens of thousands of war refugees from the Middle East stranded in Hungary. Her words reflect a widespread attitude in German society today. The pictures of locals gathering at Munich’s main station to welcome refugees have gone around the world. Germans have also rushed to support organizations that care for refugees, donating clothes, and toys; to volunteer in refugee facilities; to help children with school work, and sometimes to even open their private homes to accommodate people. This willingness to help, and to provide an emphatic response to Germany’s small but radical anti-immigration movement, points to a seismic shift in German society. A growing openness to immigrants can be observed in a country that for a long time clung to the illusion that it was somehow, by definition, not a nation of immigrants—regardless of the fact that around 20 percent of Germany’s current residents are born outside the country or have at least one foreign-born parent. Merkel’s decision to follow a humanitarian rather than a legalistic approach is in part explained by these changed attitudes. It is also informed by the recent reform of Germany’s naturalization law. The new law, which was passed in 1999, allows for the integration of immigrants who no longer need to be of German descent or married to Germans to obtain citizenship. Still, there are limits to the new openness, especially with the rising numbers of arrivals, and the exploding estimates of those yet to come. Merkel’s stance comes increasingly under attack, and her popularity is diminishing. The chancellor is accused of having encouraged even more people in the Middle East and northern Africa to hit the road and seek a better future in the wealthy countries of Europe, where they might eventually overwhelm the authorities’ capacity to accommodate them, not to mention societies’ willingness to accept them. After all, most of the refugees from war-torn countries like Syria, Iraq, or Afghanistan are unlikely ever to return. They may be asylum seekers when they arrive, but Germans see them as immigrants. German society over time got not only used to the increased diversity, but in large part has also come to embrace what the immigrants brought with them. Postwar Germany has an instructive history when it comes to immigration. After all, no other European country in the period has been able to absorb as many refugees and immigrants—a total of some 25 million people. The first wave of mass immigration hit Germany at a time when it was least prepared to integrate millions of people. With the military victory over Nazi Germany, the Allies decided not only to cede a quarter of the country’s prewar territory to Poland and the Soviet Union, but also to allow Poland, Czechoslovakia, Hungary, Yugoslavia, and Romania to rid themselves of their ethnically German populations. As a consequence, what remained of Germany experienced a refugee crisis of epic dimensions. Between 1945 and 1948, about 12 million refugees and expellees poured into the war-devastated country from the east. They did not receive a warm welcome. In many cases, Allied military police had to make sure locals would not deny them shelter and support. Many of the refugees found themselves exploited by farmers, who offered poor accommodation and meager food in exchange for hard labor and their remaining valuables. Notwithstanding individual cases of solidarity and generosity, the Germans from the east felt for years like second-class citizens. It was only recently that German society at large began to take a real interest in their fate and publicly recognize the enormous contributions they had made to Germany’s postwar recovery. This awareness seems to inform the perception of the current refugees. The second wave of immigration occurred in the 1960s, when West Germany’s booming industry experienced its first labor shortage. To square the circle of having to recruit foreign labor without opening the country to permanent immigration of people of non-German backgrounds, the government launched its “guest worker” program. In bilateral agreements with Mediterranean nations such as Italy, Spain, Morocco, Yugoslavia, Greece, and Turkey, Germany recruited millions of labor migrants with the understanding that they would eventually return home. No efforts were made to integrate them in German society. While many of the “guest workers” did eventually return, millions stayed for good, often because their adult children, born and raised in Germany, refused to “return” to a country they hardly knew. At the same time, Germany’s restrictive naturalization laws did not allow these children of immigrants born on German soil to obtain citizenship. Hence they often lived at the fringe of German society, with a sense of not being welcome, underperforming in the country’s school system, and exposed to various forms of discrimination on the job and housing markets. This reality discredited both the ethics and wisdom of the “guest worker” program, and led to the recent reform of the German naturalization law. Yet before Germany was ready to fully embrace immigrants of diverse cultural backgrounds, the government would try one more time to fit a square peg into a round hole. In the late 1980s, the Federal Republic addressed its low birth rate by inviting ethnic Germans from Eastern Europe in as permanent immigrants. Within only a decade, more than 3 million people arrived, mostly from the Soviet Union and its successor states, but also from Poland and Romania. While they came officially as ethnic Germans, their presence led to a mushrooming of Russian-language newspapers, Russian television channels, and Russian food stores—frequented also by tens of thousands of Russian Jews who simultaneously immigrated to Germany. Looking back, the country absorbed these three waves of immigration without falling apart, although none of them was handled in way that recommends itself as a model going forward. On the other hand, German society over time got not only used to the increased diversity, but in large part has also come to embrace what the immigrants brought with them. Among the customers of the Russian or Turkish food stores are also the “good old Germans,” who appreciate the greatly increased variety of vodkas and have for a long time preferred Mediterranean cuisine to Bratwurst and potatoes. Turkish filmmakers and Russian-born writers are the stars of the German cultural scene today, and nobody has a problem with the fact that a recent vice chancellor was born in Vietnam, or that among the recent stars of the beloved Mannschaft—the German national soccer team—we’ve had players with last names like Gomez, Özil, Boateng, and Podolski. The German reaction to the current refugee crisis suggests that the lessons from the past waves of immigration have been learned, and that most Germans want to get it right this time. They are ready to show the current refugees the solidarity that they denied to the German expellees in 1945, and they are willing to embrace immigration that will further increase the country’s diversity. At the same time, Germans expect the immigrants to become part of their society, which includes accepting its liberal values and secular culture. 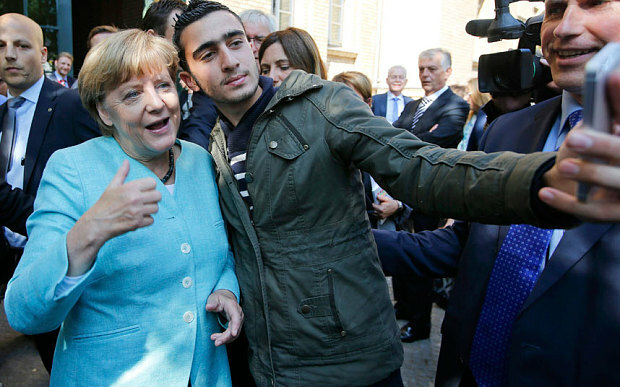 Merkel, who in 2010 declared the concept of the multicultural society to have failed, is siding with those who advocate for a “welcoming culture” when it comes to refugees and immigrants. Simultaneously, her government is taking steps to facilitate a rapid integration of those who are likely to stay. The sheer number of refugees arriving today makes that an enormous challenge. But should Merkel’s government and German society succeed in integrating the newcomers, the implications will be far-reaching in redefining Germany, explicitly, as a nation of immigrants, and in undermining the credibility of Europe’s anti-immigration movements. Gregor Thum is an associate professor of history at the University of Pittsburgh. His book Uprooted: How Breslau Became Wrocław During the Century of Expulsions explores the history of forced migration in 20th-century Europe. *Photo courtesy of REUTERS/Fabrizio Bensch.